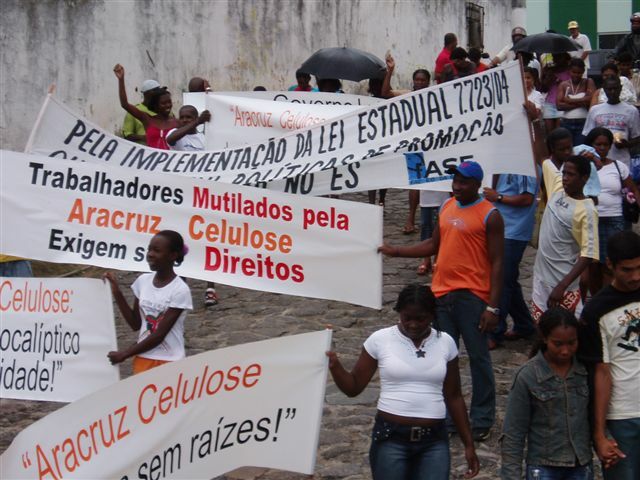 In November 2005, hundreds of quilombolas marched through São Mateus in protest against the pulp company Aracruz. By Chris Lang. Published in WRM Bulletin 103. In November 2005, hundreds of quilombolas marched through the streets of São Mateus in northern Espírito Santo to protest against Aracruz Celulose, the world’s largest producer of bleached eucalyptus pulp. “Aracruz Celulose: you are against the life, return our lands to produce food”, “Workers Mutilated by Aracruz Celulose demand their Rights”, “President Lula: The future of indigenous people is more important than exporting pulp!” read some of the banners. 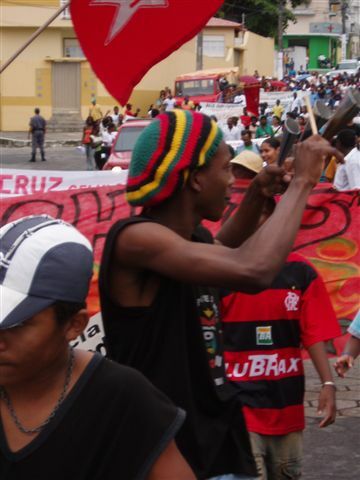 I took part in the march and walked with the quilombolas, to the sound of drumming, through the town. We walked to the river, down to the square where slaves were unloaded during colonial times. Quilombo was the name given to communities of escaped slaves during the colonial period in Brazil. By the seventeenth century the Portuguese colonists had brought hundreds of thousands of African slaves to Brazil. Many of them escaped. The most famous quilombo settlement was in an area called Palmares in north east Brazil, named after the wild palms growing on the hills. By the middle of the century, about 30,000 people were living in Palmares, in large fortified towns with chapels, statues and palaces. The first leader of Palmares was Ganga Zumba, the great ruler. The Portuguese sent expedition after expedition to try to wipe out the Quilombo dos Palmares. One after another, the expeditions failed. But in 1678 Ganga Zumba agreed to a settlement with the Portuguese. The remaining quilombo leaders refused to accept any deal while Africans remained enslaved. They made Zumbi, Ganga Zumba’s nephew, their new leader. Zumbi was eventually taken prisoner and beheaded in November 1695 and almost 100 years of quilombo resistance came to a close. Zumbi became a hero and a symbol of black freedom in Brazil. The colonists planted monocultures of sugar cane for export. The quilombolas planted maize, beans, manioc, sweet potatoes, bananas and vegetables. They raised hens and pigs, fished in the rivers and hunted in the forests. Today, another monoculture threatens the descendents of the quilombos. Aracruz has planted hundreds of thousands of hectares of industrial tree plantations on the quilombola’s land. The day after the march in São Mateus, I visited some quilombola villages together with activists from the Rede Alerta contra o Deserto Verde (Alert against the Green Desert Network). Villagers told us how their community had been completely surrounded by eucalyptus plantations. “Aracruz finished our land,” said one man. The company bought the land either very cheaply or fraudulently, by using a middle-man to buy the land for them. Two hundred people living in one village used to be employed by Aracruz as chain saw operators, but all have now lost their jobs. “Most people have moved away since Aracruz arrived. They now live in the favelas in big cities, like Vitória,” a villager told us. Aracruz took all the best land, leaving the quilombolas with only the areas that the company cannot plant. “There is not even space to keep a horse,” a villager complained. “When young people marry, they have nowhere to go, so they are staying. This means that there is even less land available,” added another man. Villager’s fruit garden, with forest in the background. We visited another quilombola village where villagers had not sold any of their land to Aracruz. Villagers have set up an organic garden where they produce banana, jackfruit, papaya, sugar, pineapple, coffee, genipapo (used by Indigenous Peoples to paint their skin), tomatoes, passion fruit, herbs and manioc. But Aracruz’s monoculture eucalyptus plantations are immediately next to their garden. Although the villagers use no chemicals on their crops, they cannot get a certificate to prove that their produce is organic because of the pesticides that drift over from Aracruz’s plantations. The contrast between Aracruz’s monocultures and the diverse quilombola gardens is dramatic. On one side are flowers, fruit trees, food crops, houses and people. On the other are rows of eucalyptus trees. Villagers told us that they can only grow manioc near to the plantations in the first couple of years after the trees are planted. 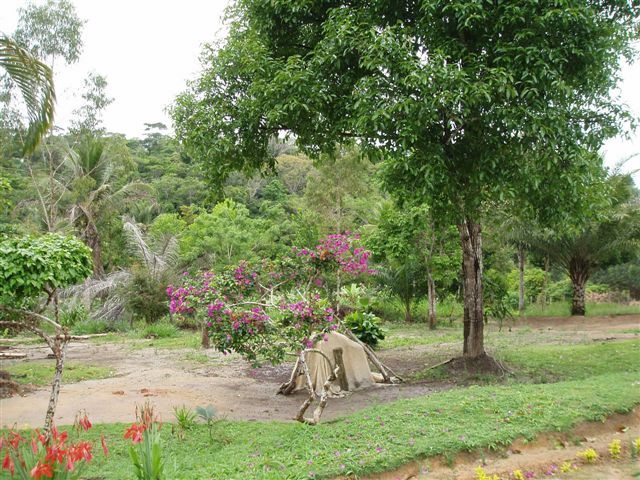 After that the trees are too big and there isn’t enough sunlight to grow manioc. 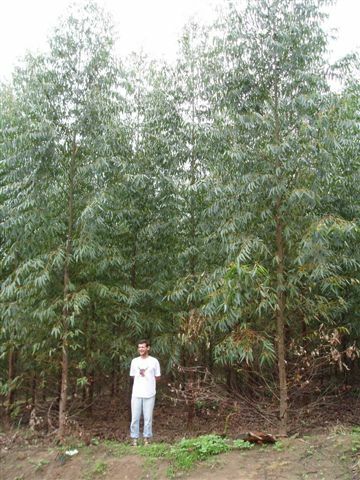 After only five months, Aracruz’s eucalyptus trees are more than six metres high. An Aracruz monoculture. These eucalyptus trees are five months old. A quilombola villager explained what they want from the company: “Aracruz can export its pulp, that’s OK. But people need jobs and to get back their own lives. Aracruz needs to resolve all these problems before it can export.” Another quilombola put it more simply. “I want Aracruz to disappear from here,” he said.